I was looking for a caricature I did ten or so years ago of Mubarak but I couldn't find it, which is annoying because I've been tripping over the thing all that time, which might've actually been more like 20 years or even 30. So here's this Blue Screen of Death, which I think was drawn for a Joel Achenbach column in the Post Magazine maybe five or six years ago. The thing I like is the stuffed toy on Death's computer with the x-ed out eyes. Snow jokes, right. 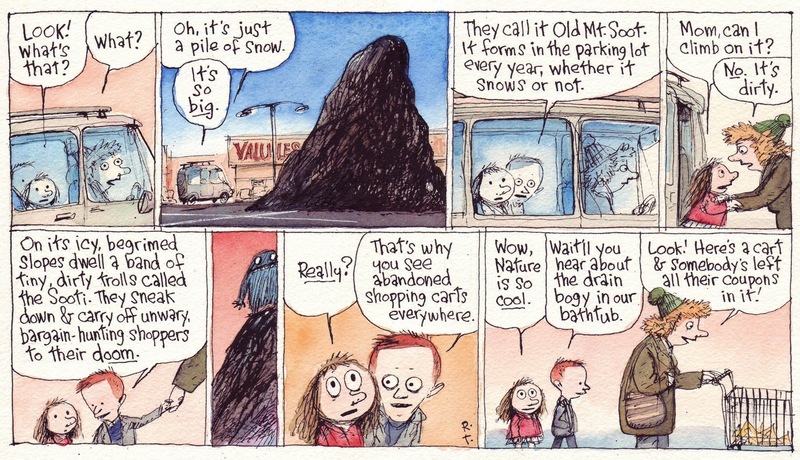 This might've been a little sharper if I hadn't shown the airborne snow in the second panel, leaving Dill's and Alice's reactions to indicate what was happening, But I like the idea of a snow blower trebuchet and I think it has a viable place in people's garages. I redrew this a coupla times trying to make Alice as animated as possible and maybe one more time would've done it, but maybe not. Somebody, maybe S.J;.Perelman, said something to the effect that he reworked his prose to hit the perfect balance between the incoherent and the lapidary, and I know what he means. Or I did after I looked up "lapidary." And it was probably Mark Twain who said it anyway. This started out as a parody of shampooese: the weird hybrid language used on hair care products. I was going to have a conversation entirely in shampooese but I couldn't figure out how to carry it off and have it make sense. So I used the old plot-counterplot trick and wrapped it up with Petey plotting out a chapter of Toad Zombies. And yes, having a small child washing her own hair with a possibly volatile combination of products is a Bad Idea That Should Not Be Attempted in the Home. 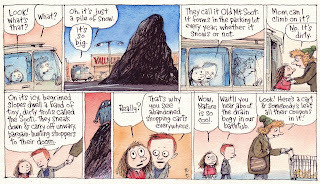 As we're getting a bit of snow here these seem almost timely, in a timeless comic strip way. Sure, blame the weatherman. Alice is talking about this, of course. Oh boy, crosshatching! It might've gotten a little dark for a snow cloud in that second panel. Hence the phrase, "Please help! I've crosshatched myself into a corner!" I started to add a sound effect as the snow hit the ground in the third panel, but I remembered a Peanuts strip that had a flake hitting the ground making a loud and inappropriate noise, which was the gag, and I decided not to. And now I forget what that onomatopoeia was. "Plink?" "Blam?" 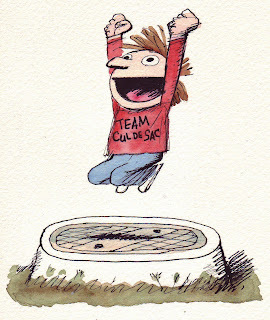 The new logo for Team Cul de Sac, at least until I can draw something better. Rough sketch below. And for those of you wishing to donate to Team Cul de Sac and who are not cartoonists, please see here. This is dedicated with great affection to my friends in comics scholarship (hi Craig, Charles & Isaac!) and to my friend Mike Rhode, who often and rightly points out that this is the golden age of comics reprints (if you've got the shelf space). Are we living in the Golden Age of Comics Scholarship? Please discuss. 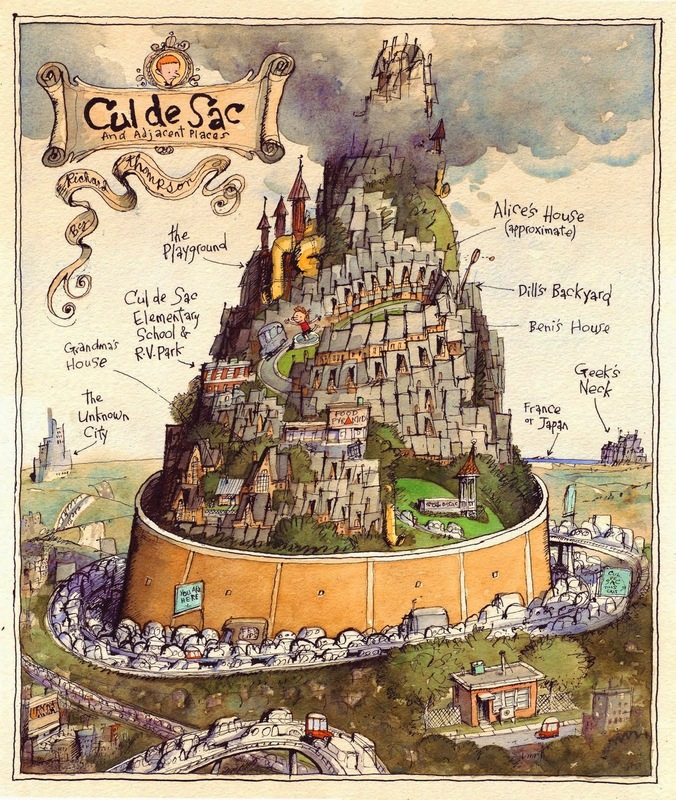 The week that was in Cul de Sac. The idea for this one made me happy, though I thought the execution was a little meh. Distracted attention seems like a ripe subject for a cartoon, especially as it applies to preschoolers. Note the use of the pointing finger in the first panel, a gesture that some cartoonist has labeled The Dumbfinger. It's a lazy thing to draw and a gesture nobody ever makes, at least in this context. But I like the black & white, stop & start panels. I'm starting to think Alice is not so much a dog person. You'll note that Alice offers to chew off Petey's arm, not hers. The theatre review was a lot of fun to write and I had to leave out a bit of it. I'm assured that the spelling "theatre" is preferred by theatre folk. My friend the redoubtable and unstoppable Chris Sparks of Sparking Design has launched Team Cul de Sac, a fundraising site for Parkinson's research. It's a part of TeamFox, the Michael J Fox Foundation's fundraising arm, which in the last year alone raised almost 4 million dollars for research. Team Cul de Sac is inviting professional cartoonists, illustrators, artists and animators to donate original art made especially for a book, published by Andrews & McMeel, about Parkinson's awareness. Part of the profits from the sales of the book would benefit the Michael J Fox Foundation, and the original art would be auctioned as part of the fundraiser with all of auction money going to MJFF. 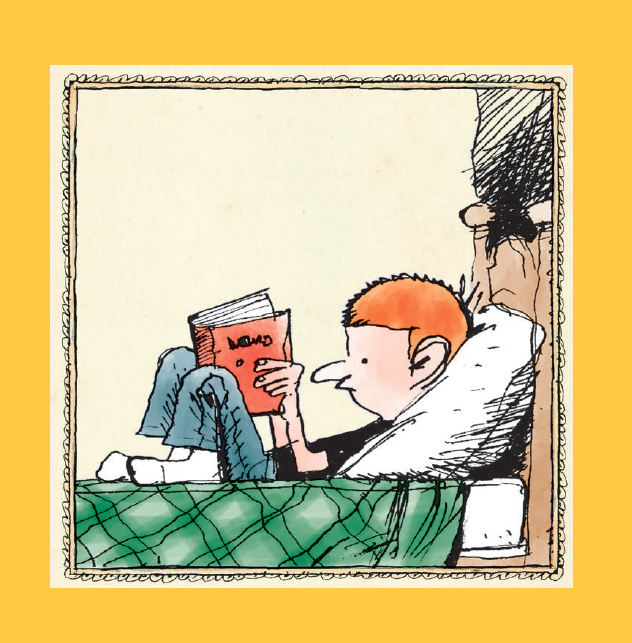 Additionally, there could be a limited number of deluxe edition books signed and numbered by Richard Thompson (that's me). The theme is going to be fun. 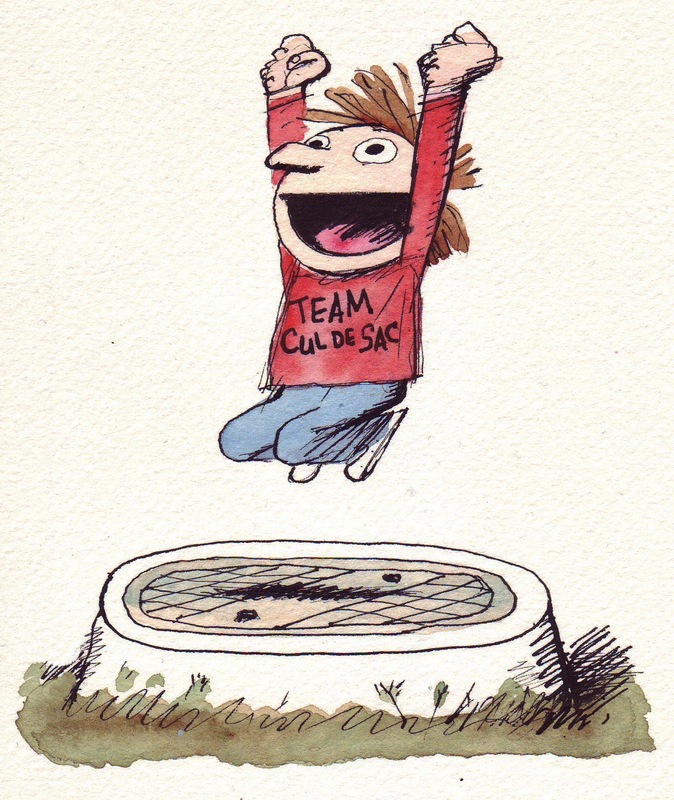 It's your take on the Cul de Sac characters. Please run with them; deconstruct them, parody them, confuse them, cubisize them, psychoanalyze them, draw them in your own strip, whatever tickles your fancy.. Enjoy. Open up your heart just create something out of the ordinary, maybe not your own characters, this is for you to let your talent to shine in a wide range of ways. Please write a little text if you would. Not necessarily about PD, but inspiration, technique, influences, determination, strength, spirituality, etc. The information for donating (who, what, when, where) is at the link. Any questions can be directed to Chris at teamculdesac@gmail.com. Team Fox was launched in January 2006 as a way for The Michael J. Fox Foundation to support the heroes all over the country who already had made it their personal mission to find uniquely creative and fun ways to raise funds for Parkinson's research. Team Fox provides guidance, tools and resources for the thousands of amazing people all over the world who are walking, running, baking, party planning, paddling, pedaling, and dancing to raise funds and awareness for Parkinson's research.In Team Fox's first five years, members raised an astounding $12 million. My profound thanks to Chris and to all who help with this. As a guy with Parkinson's, I truly appreciate it. Some may have noticed that the Sunday strip was a rerun from a few years ago. But wait, it gets worse. The strip from a few years ago was a reworking of a Post Magazine strip from almost exactly 5 years ago. If I dig far enough it may turn out I actually first drew this when I was twelve. Time for another breathless sprint through several thousand Cul de Sacs. Here ends the story of the epergne, until somebody finds it in the hall closet and drags it out again. I try to avoid making dad the clumsy, foot-in-mouth fallguy, but somebody's gotta handle those duties. There are few times more fraught with drama at Blisshaven than Sharing Time. The intensity of competing to see who can share the most impressive item must bring the pressure in the classroom up to the level of the Marianis trench. It looks like Beni's brought in a spork. Bold move. This better be good. This strip's needed a dog in it for years. 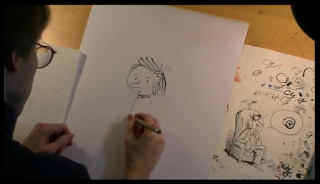 From what I can see, that is a really great drawing of a dog. Petey's only other documented fight wasn't much to see, even if he did win it. And if you'll check the previous link, you'll notice that Petey's already done a soil erosion diorama using actual dirt. Is no one doing continuity for this thing? I always enjoyed it when teachers would give a class assignment that didn't involve just writing an essay or suchlike busywork. I had a 6th grade teacher who'd let me draw my homework if it was something like a vocabulary list; I'd define the word by illustrating it (helped my grade along I'm sure). I'm all for assignments that make room for anything up to and including interpretive dance. I'm getting anxious to see this dog myself. I changed the end of this at the last minute. Marco was originally saying, "No, but the reviews are good," which is, you know. not funny. When I changed it and made Marco's eyes big I should've changed Alice's line to, "Marco! Not you too!" Here we see that dogs are fun to draw. Though not as fun as elephants. This definition of erosion is, I think, technically accurate. "Blurt" is a great onomatopoeia. Blurting Alice may stick as a nickname. That's twice in a row that Alice has had a meltdown. If it was always so dependable it might provide a useful and harnessable form of energy. But I wouldn't want to be the one to provoke her on a regular basis. Wherein we try to catch up some before we get a whole year behind. Just to remind you where we left off, this is what happened on December 21. And this is what happened on December 22. I'm sick with pride over this strip as it is undoubtably the first comic strip in the long history of the art form to feature the contrabassoon in actual graphically rendered form. And of course the fact that it's being played by an elf pushes the whole thing from the realm of the unlikely into the kingdom of the utterly impossibly fantastically absurd. Or so I thought. The above photo was sent to me by Lewis Lipnick, who for 40 years has been a bassoonist and the contrabassoonist for the National Symphony Orchestra. 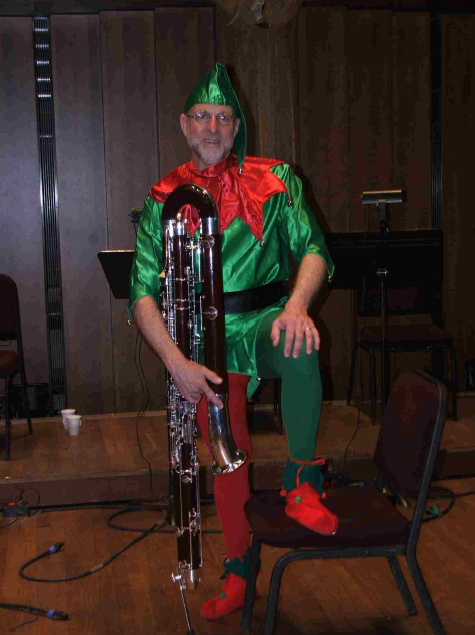 And once, too briefly, he was the Hanukkah Elf at the NSO Christmas Pops concert in 2005, where he played a series of Chopin pieces arranged for contra and orchestra. According to Lew's email, none of the guys in the orchestra knew he was going to show up in Hanukkah Elf duds. Lew says, "So when I walked out on stage wearing red and green tights, pixie shoes and an elf hat, the orchestra and audience both lost it. People in the hall were going nuts, and the guys in the band were laughing so hard that we had to wait for them to compose themselves before we started the piece." And the explanation for the Hanukkah Elf playing Chopin is that, obviously, Chopin's cousin twice removed wrote the Dreidel Song. This is the kind of thing that makes the performing arts so glamorous and leaves the graphic arts in the dust. Somehow even Christmas Eve is a little bit of a letdown after that. I snuck downstairs at least once at 4 AM on Christmas. This seems awfully unheartwarming for a Christmas strip. I often read the comments left on Gocomics by readers. One that can be left under any strip on any day is "this won't end well." So I'll just say, this won't end well. Too few comic strips with kids have them actively playing with toys, and it seems like natural territory to cover in a kid strip. 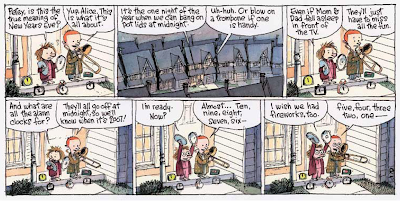 A few Peanuts strips and lots of Calvin & Hobbes did it, but most kid-play, if reduced to a narrative, is probably too random and expansive to lend itself easily to the confines of a strip. Epergne is just too fun a word not to be used in conversation at least once a week. And as an object, the epergne has an ornate Edward Gorey gruesomeness that's hard to resist. This opens up a lot of plot possibilities, I think. This is just a mashup of the last few strips. We were in a restaurant last night and my wife said, "There goes a Dill hat!" And sure enough, a small child in a purple, double tasseled Dill special walked by. If I could just find one in my size I'd probably run screaming. Time having somehow gotten ahead of me I'll post this one and work backwards to wherever I left off. Which seems appropriate for a time travel strip. Science fiction has probably used every possible permutation of time travel, though I'm not sure when the go-back-and-slap-yourself variant might've been tried. I'd meant Petey to be a bit grimmer in his take on time travel but he ended up being kinda cheerfully fatalistic and, in the fourth panel, almost wise. He's obsessive and self conscious enough that, if he was given the power of time travel, he'd undoubtably use it to relive awkward moments and berate himself. But he wouldn't take the extra effort to go back slightly further in time to avoid that awkward moment. I'd thought about ending this with a future-Petey showing up in the last panel with his hand raised to smack the now-Petey and the now-Petey saying, "What'd I do now?" But I didn't. And yes, I photoshopped the Petey in panel one from panel two. Either I'd screwed up the drawing of panel-one-Petey or panel-two-Petey just travelled back in time. When I was a kid, we'd watch Guy Lombardo and at midnight, under the watchful eyes of my parents, we'd go outside, bang pot lids together and yell Happy New Year. We didn't this year; there was no Guy Lombardo so we watched the Marx Brothers and when midnight rolled around we weren't inspired enough to make a racket. Oh well. This is an old CdS from the Post Mag and I've posted it before. These are lazy days.